A digital transformation project takes time and typically progresses through stages. The first stage is real-time operations visibility and the last is predicting failures before they occur. What are the stages in between? 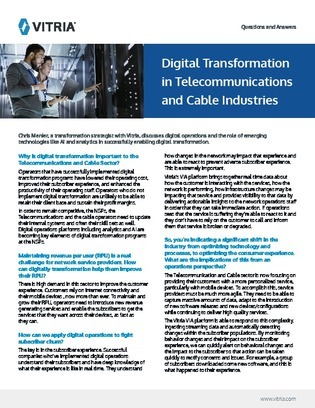 In this resource, Chris Menier, a transformation strategist at Vitria, answers 7 questions surrounding digital operations and the role of emerging technologies like AI and analytics in successfully enabling digital transformation in the telecommunications and cable sector.